Trump officially clinched the Republican presidential nomination Wednesday. 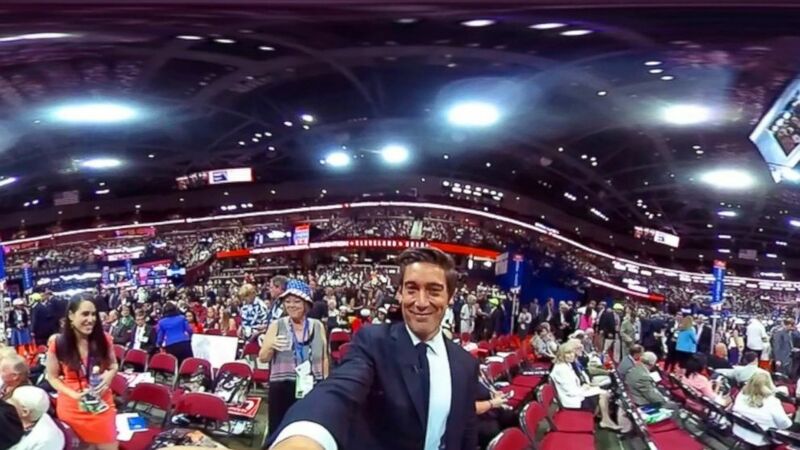 camera (Ronnie Polidoro/ABC News) ABC's World News Tonight anchor David Muir on the floor of the Republican National Convention in Cleveland, July 19, 2016. Take a 360-degree tour inside the Quicken Loans Arena in Cleveland, Ohio, just after Donald Trump clinched the Republican presidential nomination. ABC News' David Muir shows viewers the arena, which is blanketed in posters asking voters to "Make America Great Again." No fewer than six members of the Trump family are speaking at the convention this week. Trump officially clinched the Republican presidential nomination Tuesday evening after securing enough delegates during the roll call vote on the floor of the convention. A rules change allowed New York to announce its vote out of alphabetical order so that it could be the one to put him over the threshold of 1,237, and the announcement of Trump's victory sent waves of cheers rippling through the arena.